Everything seems to come to a head at the same time dear reader, have you ever noticed that? I'm sure this situation is going to be one that hopefully most readers haven't had to deal with, being stalked by your own mother! 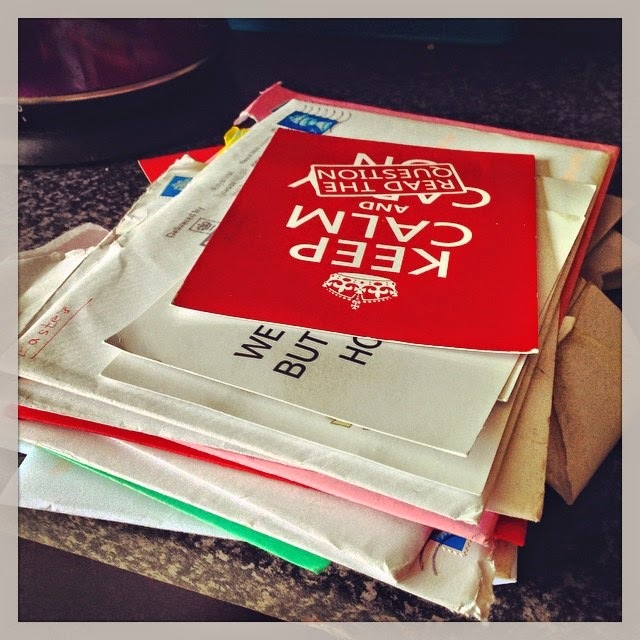 This is actually just a small portion of the pile of letters she's sent since January, at first we would bin them all and then we started saving them for the police under the anti stalking an harassment laws, it's been a while now since our therapist advised us to stop her having contact with the children, I'd written her out of my life for several years but she never really goes away, in her time she's written to friends to tell them to not be friends with me, my relatives to tell them not to see me, she's frightened off many a relationship with her letters and quite frankly after comment on my blog today enough is actually enough, the letters are only the start of it, she sends postcards, correspondence to my office with disguised hand writing, she emails the children and calls them from an unknown number, we've all blocked countless email addresses so she just gets new ones, I can't even profess just how utterly draining this can be for both my children and I, I have to be on constant postman watch and sometimes because of the postcards it gets difficult but I have managed to protect the kids up until now. If you're in the same situation go to the police because they can help, I've resisted so far because even after years of therapy I find this stuff difficult to deal with and I think our police have so many more important things to deal with like murder etc but today I am taking a stand and sending out a warning, if this doesn't stop immediately I will be involving the police.